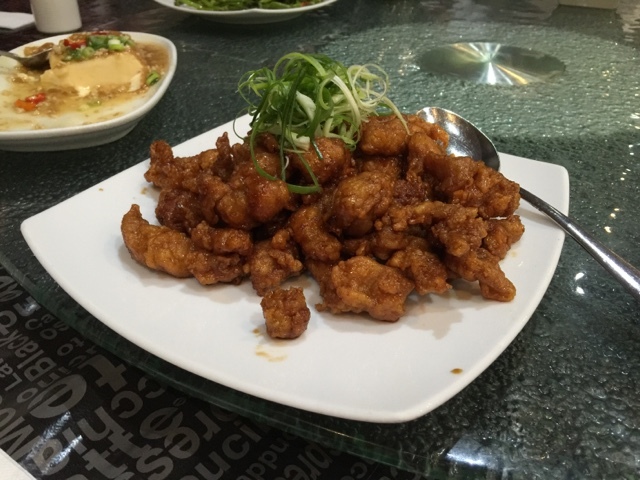 There's nothing like a good Chinese food meal to end a weekend. When my former cell (youth group) leader suggested a catch up dinner, we all jumped at the idea. When he suggested Hawker's cuisine, we jumped even higher. 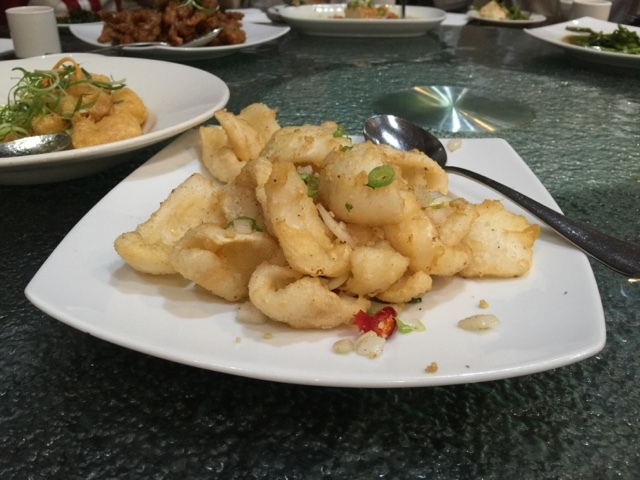 Hawker's Cuisine has to be one of my favourite Asian restaurants, and judging by the constant crowd, it must be a lot of other people's favourite as well. We know we were going to have an awesome dinner here. When we arrived, our in house Hawker's Cuisine menu expert, Miss. D took charge of the ordering and we all just reaped the benefits. Below are what we shared between the 10 of us. In one word, our dinner was, perfection! We ordered just the right amount to leave everyone content and Miss. D did an excellent job in choosing all the dishes. The highlight had to be the marmite chicken and pork ribs in Thai sauce. 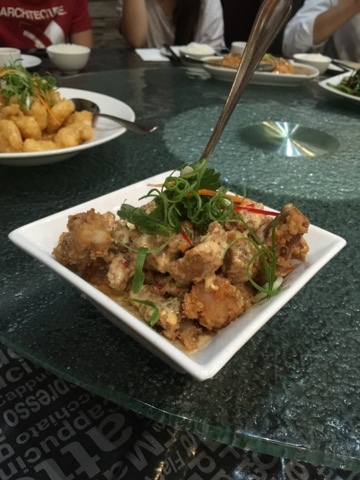 Both those dishes were extraordinarily tasty and addictive, both are a must have when dining at Hawker's cuisine. 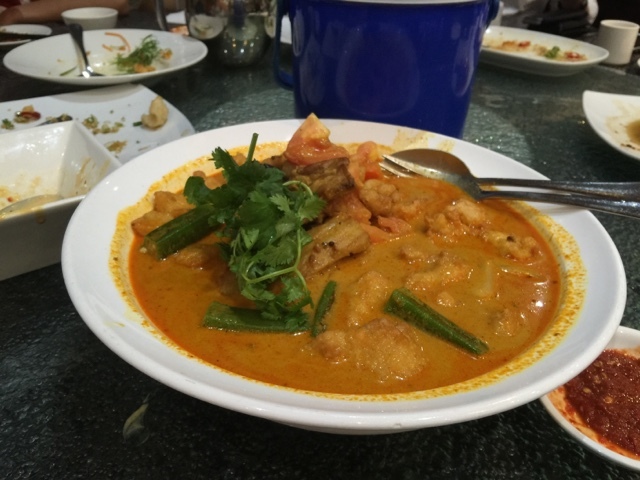 This was the first time I've had the curry fish fillet here and everyone really enjoyed it. A bit pricey compared to the rest, but the size and flavours made it worth it. 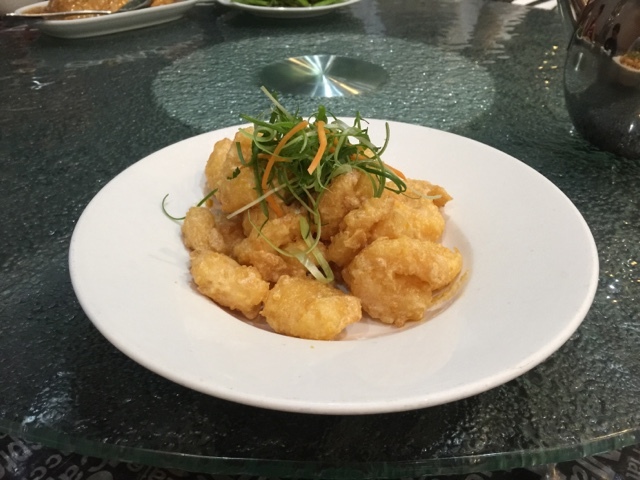 Not much words needed for this blog post, just know that if you've been looking for a great Asian restaurant, well look no further than Hawker's Cuisine! Disclaimer: Restaurant information was true and correct on 10th Feb 2016. Unless you've been living under a rock, then I'm sure you've heard of the freak-shake phenomena taking over the world. One place in Perth that has been very popular for their freak shakes is Cafe 2 TwentyFour. Their photos of their freak shakes (or mega shakes as they call it) attracted me and Miss. D to visit on a fine Friday morning. We were glad we planned this lunch on a weekday as we've heard of the excessively long queue Cafe 2 TwentyFour attracts on weekends. On this particular day we had no trouble getting a table. As soon as we were given the menus we went straight to the shakes section to check out their selection. To my dismay, Miss. D did not want to join in my mega shake party and encouraged me to order the "healthiest" shake they had, the strawberries and cream. Ok, so other than the two strawberries in this shake, there's probably nothing else healthy in this shake, but it was probably healthier than the chocolatey or peanut buttery or minty based shakes right? Well, healthy or not, Miss. D and I enjoyed sharing this shake on this particularly warm day. Miss. D only had one sip, but I made sure she paid for half! To balance my "healthy" shake, I ordered the pulled pork eggs benedict. Miss. D ordered the mushroom trio with an extra poached egg, however they missed the poached egg order so her dish was poached egg-less. Being the good friend I am, I gave her one of mine, and she gave me some of her mushrooms. I have to say, I loved my pulled pork eggs benedict on its own, but with the mushrooms it was even better! The mushrooms were drizzled with a generous amount of truffle oil and it made the whole dish smell and taste amazing. The hollandaise and pulled pork was amazing even without the mushrooms and I highly recommend it for a hearty meal. So, although I invited the wrong person to have a freak shake party with, we really enjoyed our meal at Cafe 2 TwentyFour. The menu items there were traditional, but done very well and the flavours were amazing. I'll be back, maybe not with Miss. D though =P. Disclaimer: Restaurant information and prices were true and correct on 18th Dec 2015. Prices inclusive 10% GST. A quiet Saturday night in was in order after a hectic week at work. The only problem, Mr. T and I were too exhausted to cook, so we had to leave my comfortable bubble of an apartment and went in search of food. After a few minutes of driving around aimlessly and me scrolling through Zomato to find a restaurant that would accept us in our pyjama-like outfits. We made a decision to try Regal Crown. I'm not saying they attract badly dressed customers, they just looked cosy and welcoming. We were totally right, the waitress did not bat an eyelid when she saw two under-dressed zombies walking in, instead she welcomed us warmly and seated us at a comfortable table. Before we even arrived, we already knew what we were going to order. Butter chicken, palaak paneer and garlic naan. Those are our must have menu items at any Indian and Nepalese restaurants. But, to act the part of normal customers, we took a few minutes to peruse through their menu. 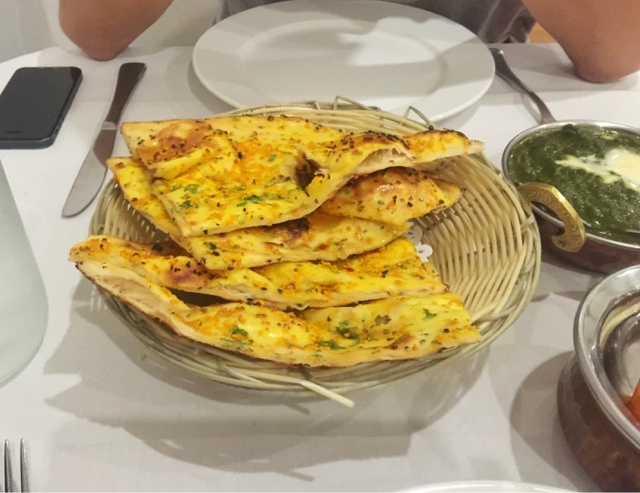 For the price of the naan, we were suspicious that the portion would be tiny and we would need multiple serves, the waitress told us, it comes with four slices and each slice the size of her palm. We resisted the urge to order more than one serve. We were glad we only ordered one serve as it turned out each slice was massive, not like the size of a palm, more like a face. I'm exaggerating of course, but, it was just enough to share between the two of us. The butter chicken serve was also generous with plenty of pieces of chicken. 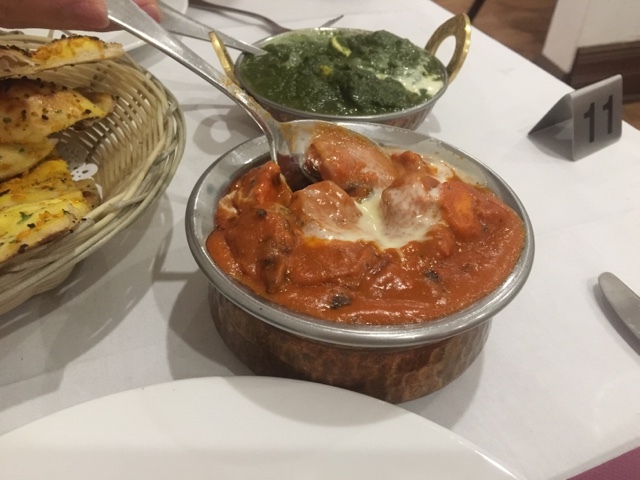 I personally thought the butter chicken was tasty, the sauce was thick and the flavours and aromas of the spices were present. Mr. T thought it was a bit too sweet. That didn't stop him from devouring it though. 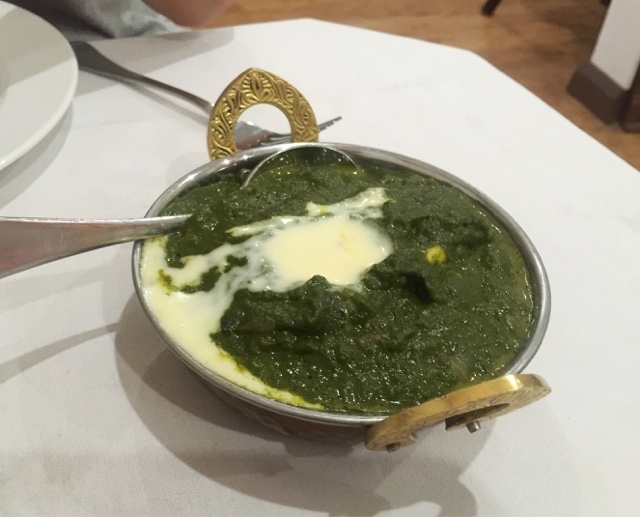 The palaak paneer was also satisfying. There were plenty of feta and the sauce was a touch spicy, but was not sweat inducing. 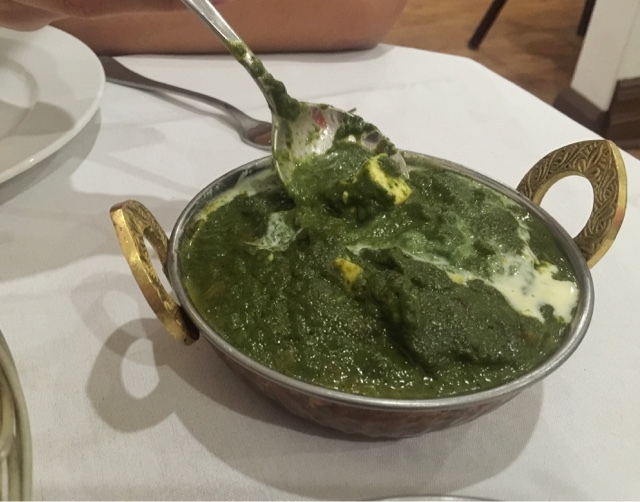 We really enjoyed our meal, mopping up every last drop of sauce with the naan. Truthfully, this probably wasn't the best Nepalese/Indian food we've tried, but the service was great and prices were reasonable. It was the perfect choice for our lazy Saturday night meal. Disclaimer: Restaurant information and prices were true and correct on 19th Dec 2015. Prices inclusive of 10% GST. It was beautiful sunny morning with the promise of an amazing day ahead. Until someone rammed into the back of my car when they failed to brake on time. Sigh. One fallen bumper and mild whip-lash later, Mr. T promised to take me to an awesome cafe to make my day better. So, we headed to our favourite spot in Perth, South Perth foreshore and we decided to try Mister Walker (Mr. W). Pictures of Mr. W's food on social media has been beckoning me and I couldn't wait to try for myself. The ever hip and lovely Miss. A was in charge of organising lunch for us. Of course she chose one of the hottest place in Perth at the moment, Long Chim. Located in the newly renovated Treasury building, now the Cathedral Square. If you haven't had the chance of checking out the new Cathedral Square, I highly recommend you go toute suite. It has a very cool Melbourne vibe and all the new dining places there are really making a name for themselves. Long Chim is located at the basement level. Even at 1pm in the afternoon it has a bar-y vibe with the neon lights. We felt hipper by just being there. As this place has been highly documented on social media, Miss. A already knew what we should order even before we sat down. Yes, don't be surprised we ordered three main dishes to share between the two of us. Needless to say we couldn't finish everything. Unfortunately, we were not allowed to take away the food, the waitress did say why, but she mumbled so quickly we missed the explanation. 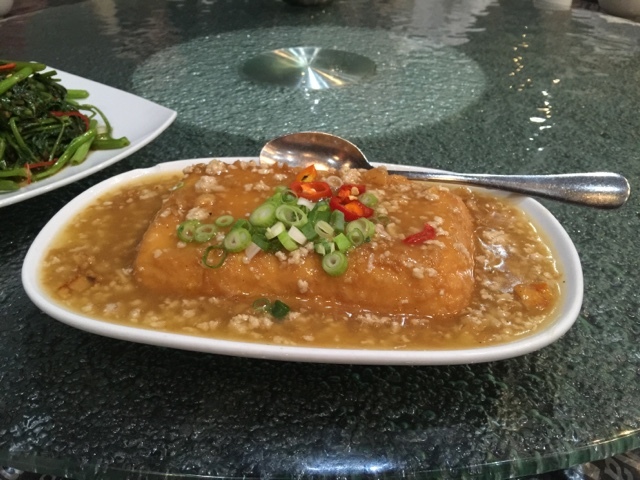 As you can imagine I really wanted to love the food at Long Chim, however, the dishes fell short of my, admittedly inflated, expectations. The pad thai looked amazing, those prawns looked so juicy, however, the flavours were not authentic and it was excessively tart. The green chicken curry was tasty, however, it was too spicy for my taste, but I guess that's my personal preference. The roast duck was the tastiest dish of the three and the duck breast was lovely and tender. The flavours were amazing too. But, for $33 there definitely should've at least half a duck on that dish! This brings me to the last dish. We ordered banana roti for dessert, again Miss. A already knew this was dessert to have. This dish was by far my favourite and I have nothing negative to say about it. The roti was crispy, there was just enough bananas and the perfect amount of condensed milk to make it sinfully delicious. The roti had a filo pastry texture, which made it more crispy than other rotis and made this dessert something special! My photos and words are not doing it justice, you seriously have to try it for yourself. We didn't love all the dishes at Long Chim and we were less than impressed with the prices, but the banana roti closed our lunch with a delicious bang and made it all worth it! It would make a great midnight snack and I wish I was having some right now! Disclaimer: Prices and restaurant information was true and correct on 16th Jan 2016. Prices inclusive 10% GST. Okay, so the title is totally misleading, it was not a light dinner so much as a feast. Miss. C and I planned this dinner four weeks in advance, so when the day arrived I just couldn't wait to finish work and head straight to the Shadow Bar. I haven't seen the Shadow Bar before and I missed it twice until I noticed the subtle sign outside the door. The vibe of the the Shadow Bar was very sophisticated and I instantly felt underdressed! But, all was forgotten once we were seated. It turns out Miss. C have been here before, so tonight she was our menu expert! For entree we ordered all of the above small plates. I personally tried the cheese puff, crab crisp and haloumi and I loved them all. Each one was flavourful, I just wished they were bigger! My personal favourite was the crab crisp, and loved how thin the crisp, adding just a touch of crunchiness. For mains, I finally chose the gnocchi after tossing up between the duck and spaghettini. It was personally recommended by our waitress, so I had high hopes for this dish. When it finally came, I was not disappointed. The gnocchi was crispy yet pillowy, the flavours were light and not overpowering. 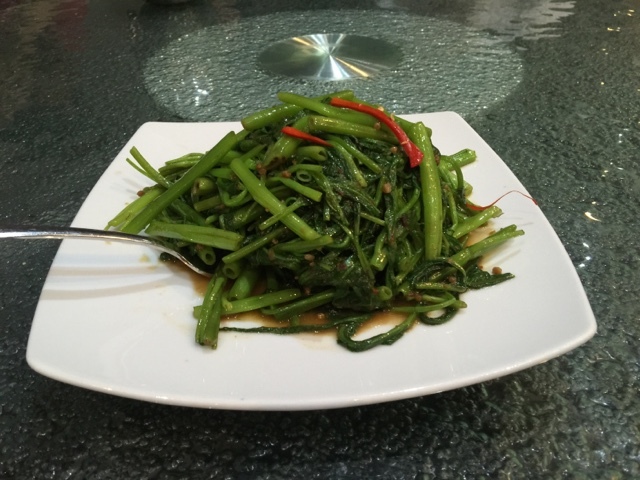 The dish was a little too oily, but other than that I loved the flavours, textures and aromas. Miss. C ended up ordering the spaghettini and I ended up tasting some! Miss. C's partner ordered the fish of the day, which he said was lovely, but there was not enough of it on the dish. The spaghettini, on the other hand, was a big hit at our table. Again, the flavours were refined and subtle, there was just enough of it. The texture of the spaghettini was superb and it was cooked perfectly. The side dish which deserves a special mention is the crispy potatoes. They looked crispy and they were crispy! We loved how they left the skin on the potatoes and we loved picking at this dish so much we didn't let the waitress take the dish away until it we had finished inhaling all the crumbs. Even after all the entree and mains we had, we couldn't resist ordering desserts, first we agreed on trying only one, but after looking at the menu we couldn't settle on one. So, we ordered two, the Strawberry Jelly and the Pear Tartine. The strawberry jelly looked super cute in the serving glass with the layers and colours. It tasted even better than it looked. It's important to dig straight down the glass to capture all the elements! The pear tartine did not look very cute, but the flavours blew us away. The pastry was very light and crispy, the poached pear was perfect and the vanilla ice cream was smooth and creamy. It was pear heaven in every spoonful! The month wait to catch up with Miss. C and check out the Shadow Bar was certainly worth the wait, the food was amazing and the company was even better. If you have a sweet tooth like us, I would recommend prioritising the dessert over the entree! You do not want to miss out on those amazing desserts. 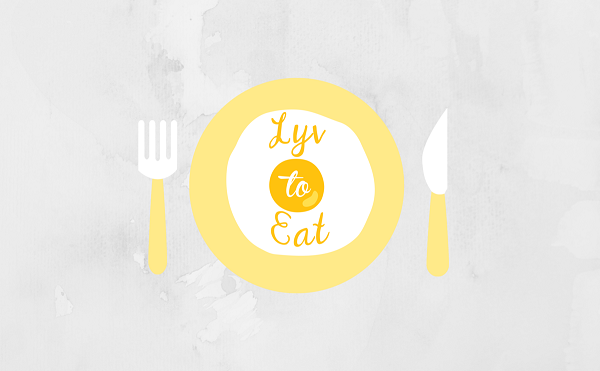 Disclaimer: Restaurant information and prices were true and correct on 13th Jan 2016. Prices inclusive of 10% GST.